The town of Riba-roja in Spain is virtually at a cul-de-sac when it comes to road connections. The C12 is a main road that leads up the river Ebro past Ascó, with its two nuclear plants, and reaches Flix, which a decade ago infamously made the news when it was revealed that the chemical plant there had been polluting the river with highly toxic mud, prompting a cleaning operation from which a dike built to try to contain the mud is still visible today. From there and to the north, the C12 eventually leads to the motorways connecting Barcelona and Madrid, the AP2 and the A2. To the northwest, a narrow road follows the river and the tracks from the Tarragona-Zaragoza train line up to Riba-roja. The nuclear emergency plan for Tarragona, PENTA, called for an evacuation path to the north in case of an incident in the nuclear plant of Ascó. Flix has the C12, but the town of Riba-roja has nothing else than a narrow winding road leading west up the Serra de la Fatarella mountains, where driving faster than 30-40 km/h is impossible, meaning that the only escape route for the people of Riba-roja is to double back towards the nuclear plant to Flix to take the C12. In order to solve this safety contradiction, a new road was planned. 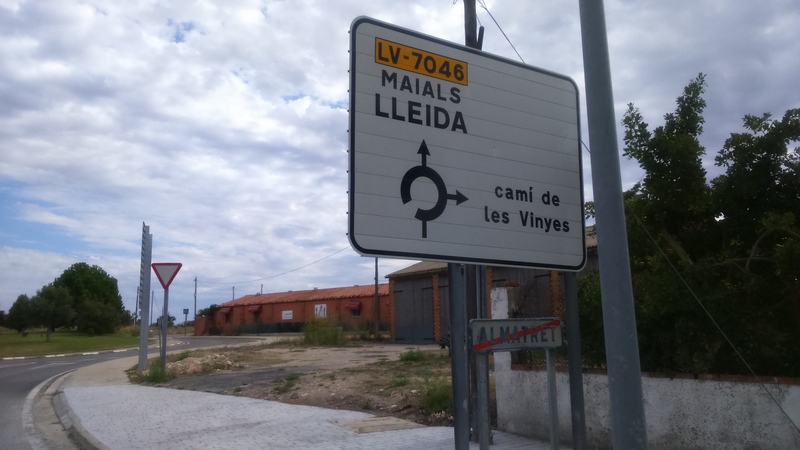 It was to cross the river Ebro at the far end of town and then lead north to Maials, from where main roads connect to Fraga and Lleida. In 1997 a new bridge was opened. 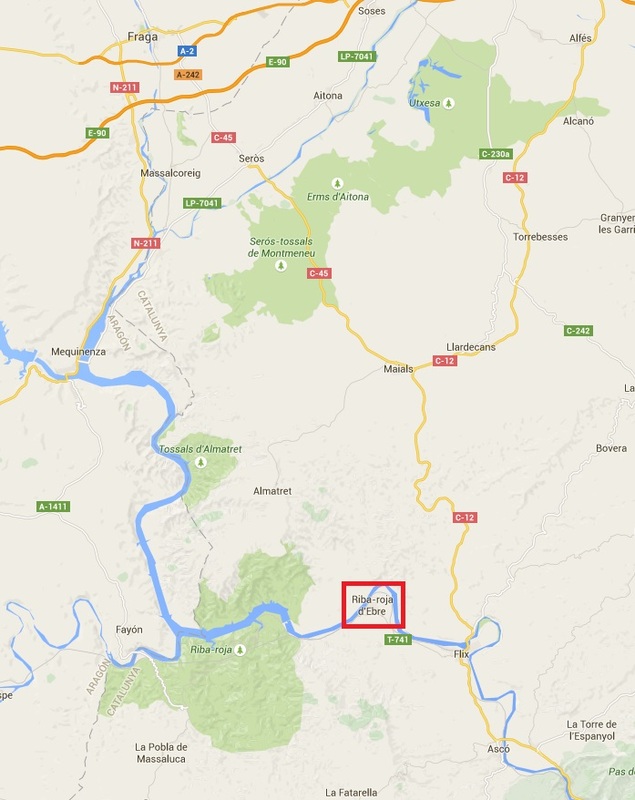 At a cost of 800 million of the old pesetas, it span 350 metres across the river Ebro to… nothing. Absolutely nothing was built on the other side of the river, meaning that the only practical use of the bridge was for the farmers to cross the river and easily access their fields on north bank without having to drive down the river to the nearest bridge in Flix. Handy if you live in Riba-roja and your apple trees are on the other shore, not so handy if you want to get the hell out in case of a nuclear meltdown in Ascó. I had driven past that bridge several times, but as my route always took me to the small road up the Fatarella mountains, I had never paid any attention to what was at the other end of the bridge, until some months ago I heard about it on the news. 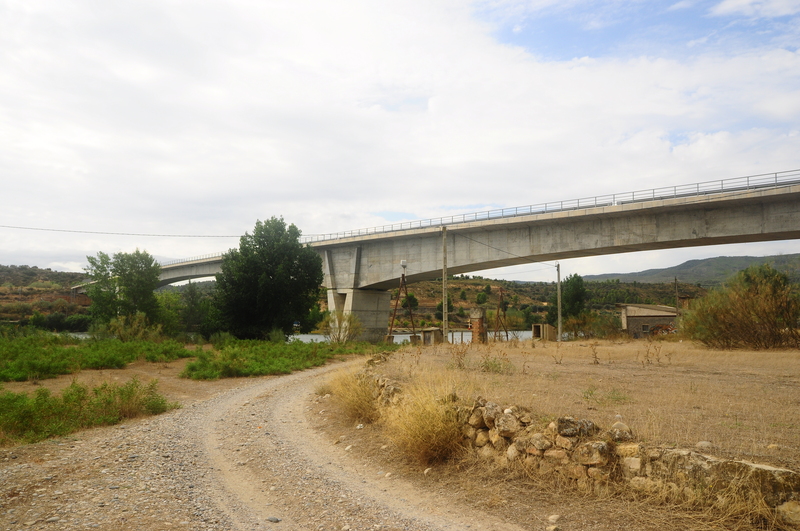 Being the curious type, I checked out some maps and decided that the next time I was in the area I would cross this bridge to nowhere and see if I could somehow connect to Maials and then on to Mequinenza without having to go all the way around to Fraga. On the maps there seemed to be a network of paths and dirt roads on the other side of the river, the kind of thing that connects different farms and crop fields, so I figured that if I found the right way through them, I could make it. So a few months later, here I was, on the northern shore of the Ebro, looking back at the bridge I had just crossed and taking some pictures of it for the blog. Standing under it, I fully appreciated what a huge thing it was, and what a huge waste of money it had been to build it and not finish the road connection on the other side. 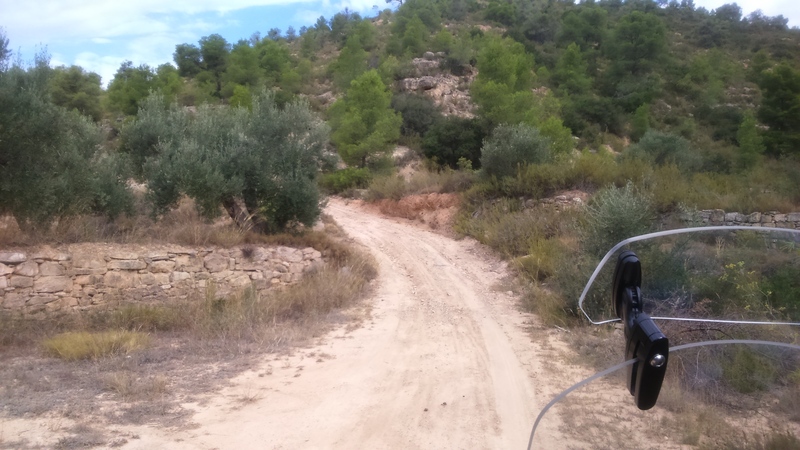 To my surprise, the road did not immediately end after the bridge as I had always heard, but it went on for about 500 metres where a road sign warned that the road was unpaved from there on. Strangely, it was not, it was just really bad tarmac, the kind that disintegrates into gravel and a bit further down the road I saw a sign that confirmed my suspicions that it was possible to connect to Maials – a sign that read ‘Almatret’ which according to the maps was a tiny village in the middle of the maze of dirt roads I had seen before. But things were not going to be so easy, after some kilometers of narrow desert road, the tarmac ended, and from there on it was only a kind of fire service road, the kind you need a proper four wheel drive to negotiate, not a car. I made my way carefully, as I was alone, on a heavy bike and with no phone signal on a road that barely anybody seemed to use. The path became steeper and steeper as it moved away from the river valley and up the mountain, and I was wondering how much further I would have to go before I found the village or things became too complicated and I had to turn around and go back to the bridge. Fortunately, the path seemed to have reached higher ground and it leveled off. In front of me I saw a farmhouse with a regular car parked in front of it, which meant that the road ahead had to be easier. It was. 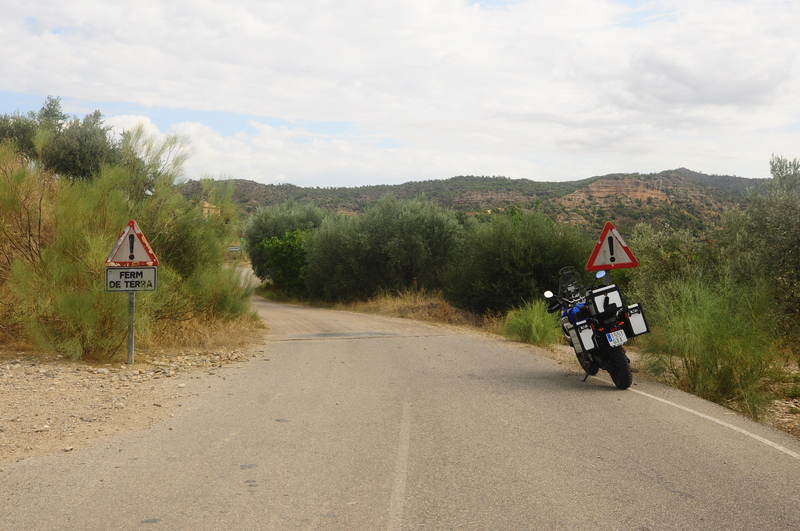 A few corners later I found good tarmac again, a road starting just outside the village I had been looking for. In the centre I asked an old shirtless man with a great round belly whether it was possible to connect to Mequinenza from there. I was glad to hear it was, and listened carefully to his directions, trying to remember the details. I left the village on a good road, heading for Maials, which I imagined was the road to which the bridge had to connect someday. 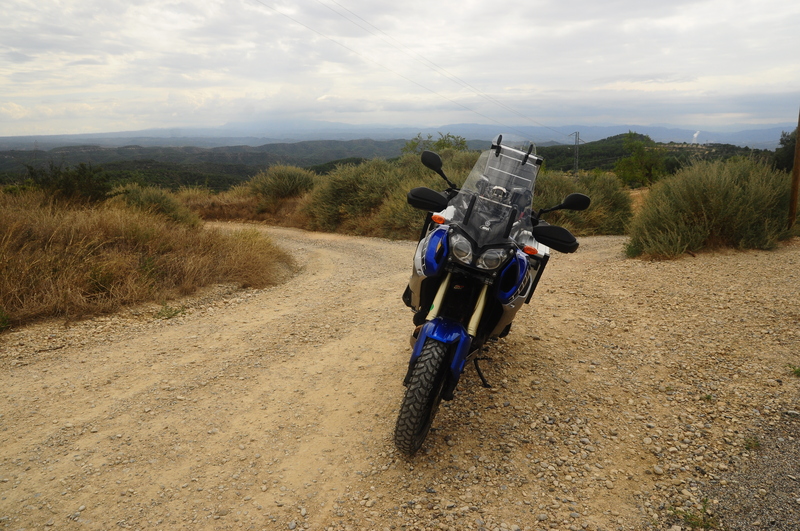 There I was supposed to turn off to the left and find a dirt road leading to a place called La Granja d’Escarp. On the GPS the dirt road I was supposed to take seemed to be one of many between Maials and where I wanted to go, so before I got to Maials I decided to take a chance and turned into the first dirt road that looked in good condition. Bad idea. I went into a maze of dirt roads that only deteriorated until they turned to small paths no matter which one I took. None of them seemed to lead anywhere, least of all the village I was trying to find. Not wanting to double all the way back because I had had to take the bike across some nasty bits of path, I followed the map the best I could to get back to the main road just past Maials. 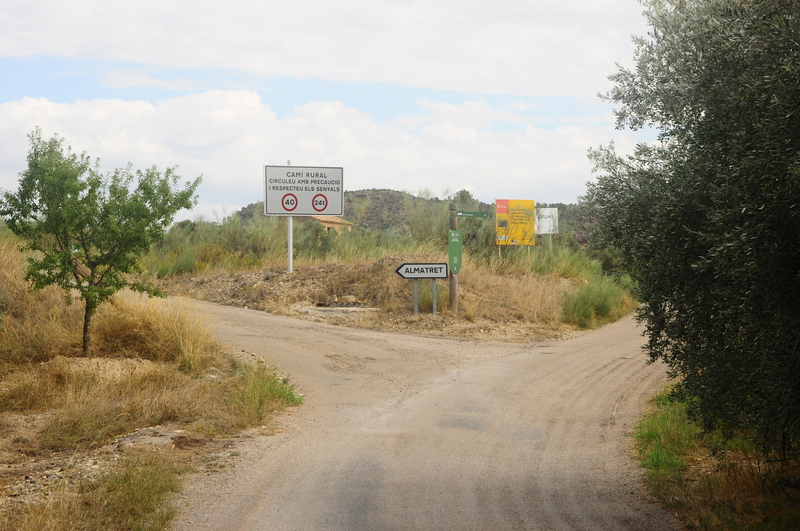 To my delight, before I got there the dirt road led to a paved one and a bit to the west I came across a sign that pointed to La Granja d’Escarp. This was the road I had been looking for, I should have ridden past Maials instead of turning into the dirt roads before. Even though it was paved, it was little more than a dirt road with some tarmad on it, but it was way better than the paths I came from. 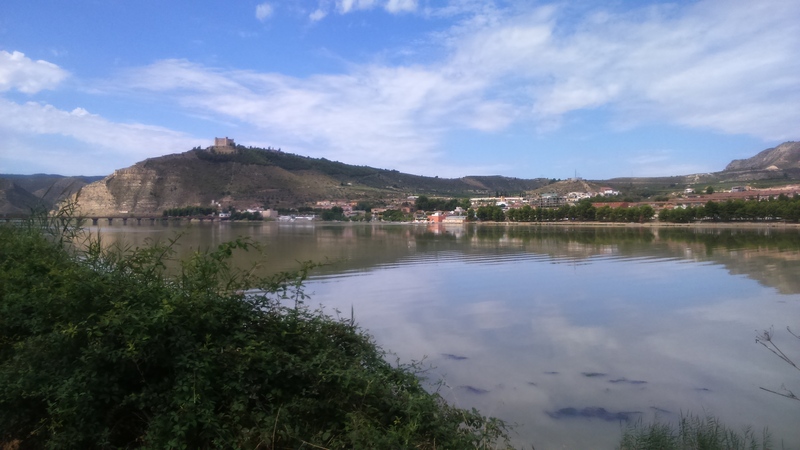 After riding down a gentle slope for some kilometers, I arrived to La Granja d’Escarp, on the shore of the river Segre, which I followed south for a short while until it connected to the Ebro and I found Mequinenza. It had been an exciting ride, but I could not imagine that the route I had followed on dirt roads would be much help in case of a nuclear emergency, no matter how big the bridge was. Fortunately, the reason I had heard about the bridge on the news was that a project to complete the road had finally been revived and terrain and the environmental studies needed for the approval of the project carried out. Let’s hope Riba-roja is not in a cul-de-sac for much longer. 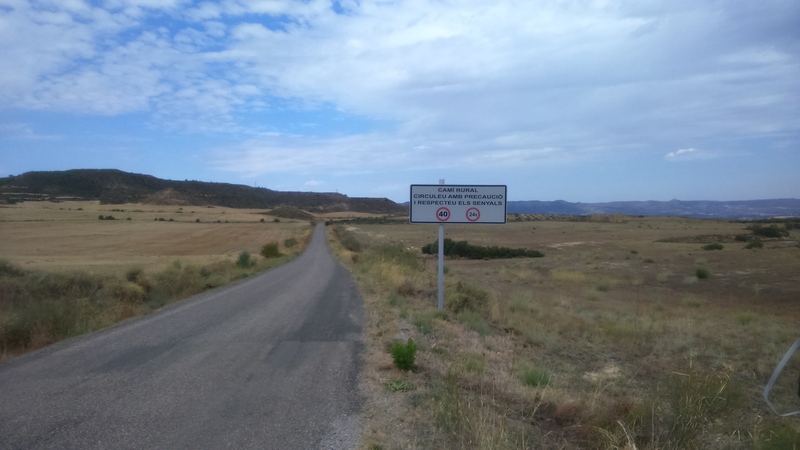 This entry was posted in Travel and tagged Almatret, Ascó, central nuclear, Ebro, Flix, La Granja d'Escarp, Maials, Mequinenza, puente, Riba-roja, Segre by Kilian. Bookmark the permalink.